Cash Wise Foods is a regional grocery chain owned and operated by Saint Cloud, Minnesota-based Coborn's. The Bismarck location opened in 1982 and recently completed a significant face-lift that included an improved checkout and bagging system. The Bismarck store originally opened as Holiday Plus Warehouse, which was the grocery division of Holiday Companies (whose parent was then Erickson Petroleum). It held a soft opening on July 7, 1982 and grand opening July 21. The store added 17,000 square feet to its original 40,000 just the following year. Even at that, it was already the company's largest warehouse-style grocery store and served as a prototype for future stores. 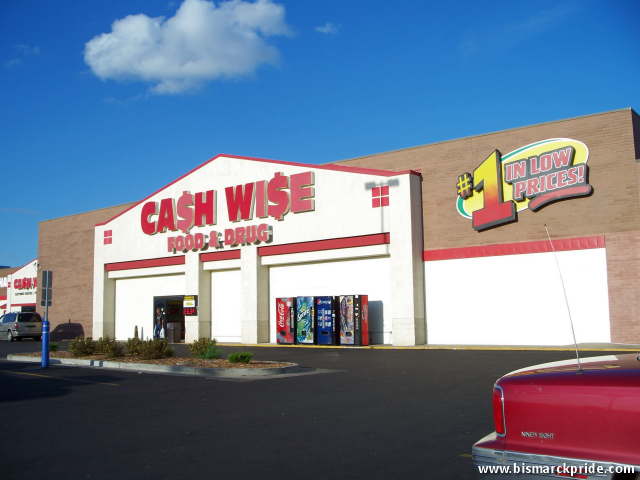 In or around 1990, Coborn's purchased the local store and re-branded it "Cash Wise." From 1994-1996, the store temporarily reverted back to Holiday Companies, as SuperFair Foods. Cash Wise completed minor renovation in 2007, which included the addition of Little Dukes convenience store. Another, more significant, renovation was completed in 2017 that included a new exterior facade and a new checkout and bagging system.